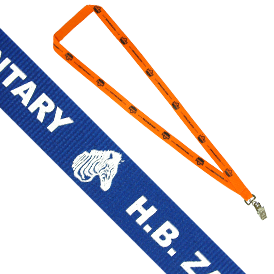 Woven silkscreen polyester lanyards are one of our lowest priced lanyards and one of the most popular. Text and logos are silkscreened directly onto polyester. One PMS matched color - step & repeat imprint - on one side of lanyard. Additional imprint color is available for an 0.18 (A) run charge and a $30.00 (G) set-up charge per color. 4 color maximum. For double sided printing add 0.18 (A) run charge per color, no set up if the design is the same as the first side. Three weeks after artwork or pre-production sample approval.